How was the weekend? Mine? Productive! Not sure if you know but this weekend has been a LONG weekend, Labour weekend here is Victoria Australia . I am emphasising the ‘long’ as my daughters school also have Tuesday off too. Oh and by the way I managed the perfect meringue with the help of a 100*c pizza oven and 1 hour and 15 minutes, THE.BEST.I’VE.EVER.MADE I know thats big news. I think you probably guess I am pretty excited about this way of cooking. Its been a long time coming (nearly 18 months) but worth every hand cut cemented brick. None of the above has so relevance to this loaf but I needed to share my excitement. 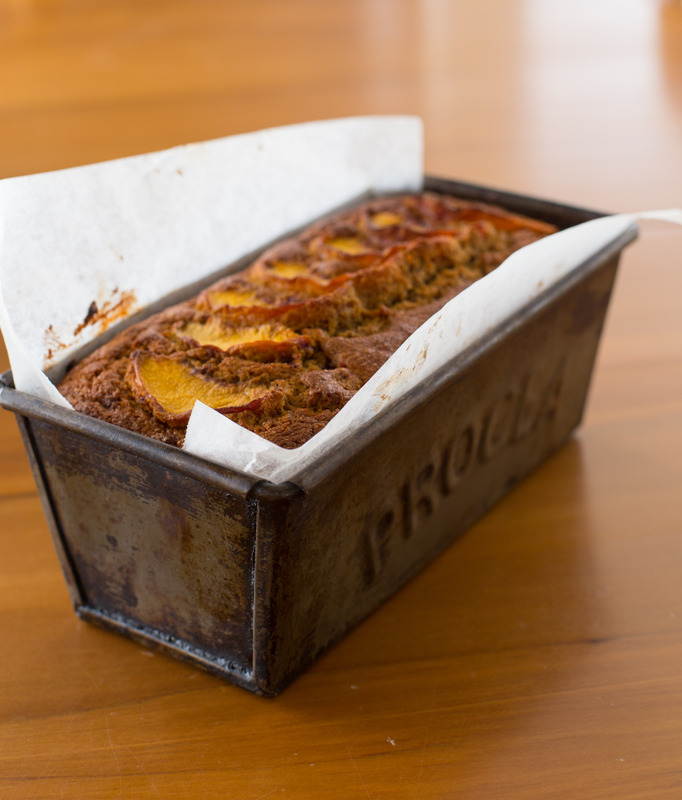 The peach and raspberry loaf has been a bit of an experiment as I am trying to keep the kids lunch boxes interesting, healthy and nut free (school rules). It’s a struggle some weeks I tell ya. Just so happens that peaches are still in season (just) and raspberries I keep in the freezer for occasions like this, smoothies or porridge. 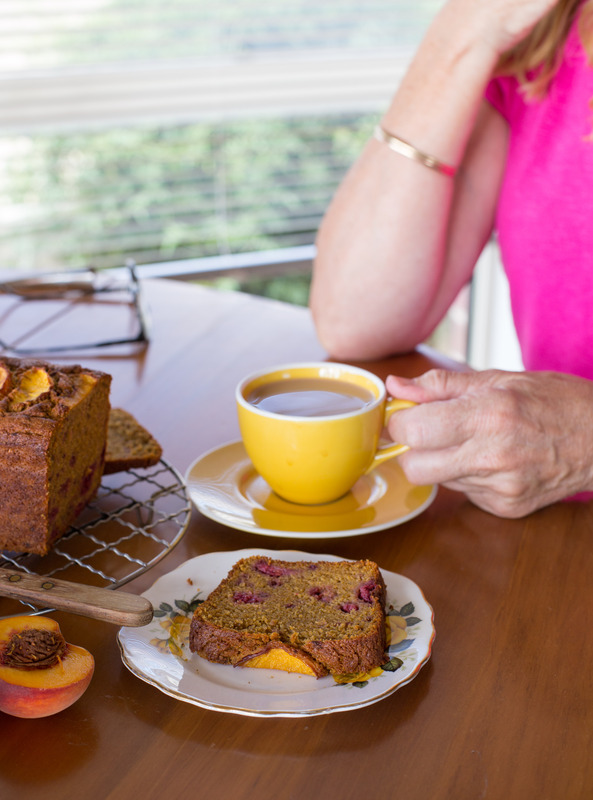 I had this idea of the classic Peach Melba but in cake form and on the healthier side. 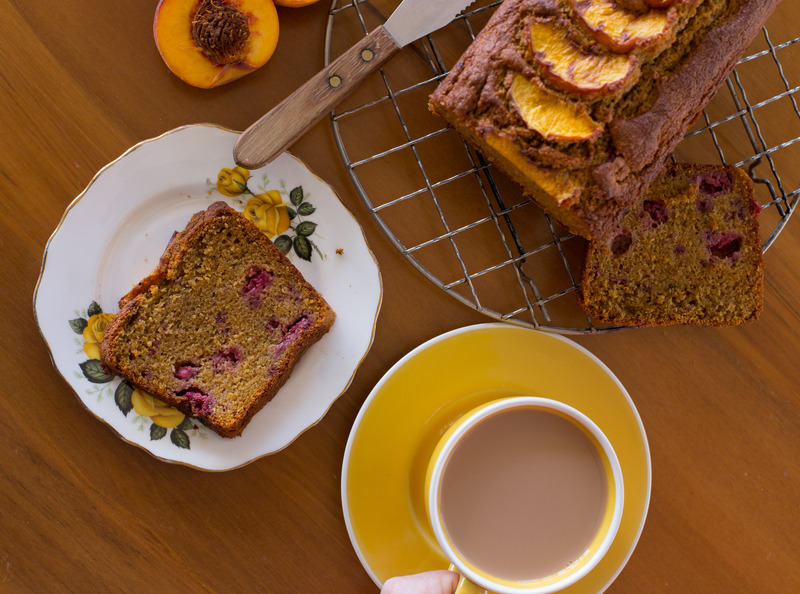 I think I have ticked the major boxes with this super moist peachy, zingy raspberry loaf (I hope, I am sure you will let me know otherwise). The bonus with this loaf is that it’s a one bowl wonder making it super quick to throw together and less of the washing up duties. Preheat the oven to 180*c fanbake Grease and line a 10x21cm loaf tin (or around this size) with baking paper. Destone your peaches and throw the fruit into a food processor and blitz until you have a peach puree. Add the butter, eggs, sugar and vanilla and blend until they are reasonably mixed. It will look a bit like a curdled mess but ignore and push through this stage it will get better. Now grab your dry ingredients-flour, baking powder, baking soda and salt and add this to the wet mix, blend until just mixed. Take your frozen raspberries and fold through the loaf mix. 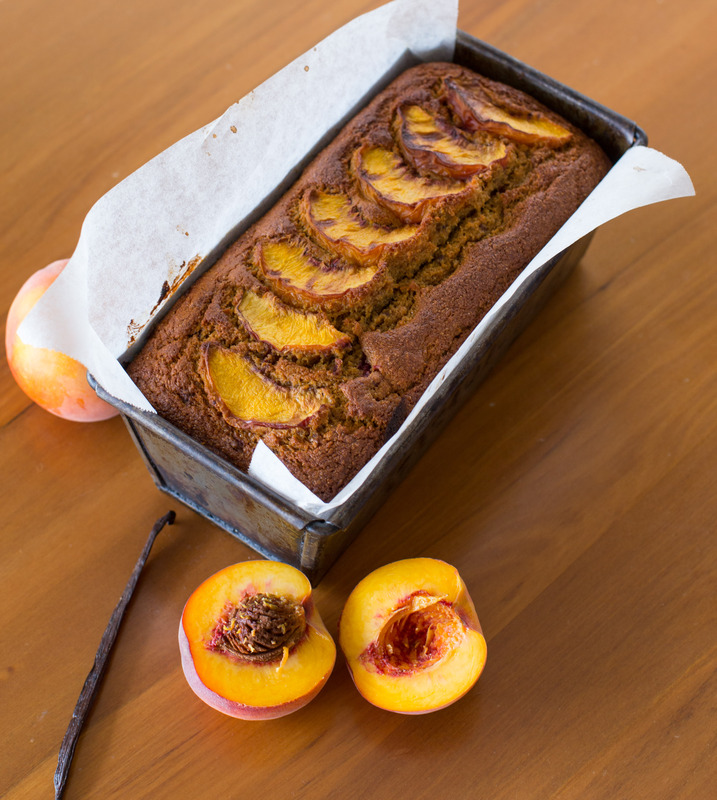 Pour this mix straight into the lined loaf tin and lay slices of peaches on the top. Bake for 50 minutes to an hour. Check at 50 mins with a skewer and if it comes out clean, if so you are good to go . Let the loaf cool for 30 minutes in the tin before turning out and cooling COMPLETELY before cutting. It’s a delicate wee soul so go easy with your knife skills. Its probably worth keeping it in the fridge as I found warm weather +moist cake=Mr mouldy is likely to move in. Now this is one of the most beautiful cakes I ever saw!! WOW can’t wait for peach season in Japan! How beautiful, and peaches are perfect right now! Can’t wait to make it. Did you manage to try the recipe out lis?